The Menu in Pacific Beach has some of the best breakfast items in town! It’s the perfect place to spend time with family or catch up with friends over some blueberry pancakes and coffee. The Menu’s mouth-watering dishes include omelettes, scrambles, pancakes, waffles and so much more! Our favorite item, though, has to be the daily special with banana pancakes and apple-wood smoked bacon. The menu also has great Mimosas and Bloody Marys – perfect for those days that you need more than just orange juice to quench your thirst! Located just two blocks from Mission Bay on Ingraham Street, the next time you’re in the Pacific Beach area be sure to start your day at The Menu! If you’re in the La Jolla area and craving some delicious sushi, Del Sushi caters to busy people on the go! They provide take out or delivery service to the UTC area and do not have restaurant service. The Del Sushi menu includes everything from traditional rolls to baked rolls to soup and even side dishes. The sushi is always freshly made and is priced very cheaply compared to sushi restaurants in the area. Our personal favorite menu item is the Baked Salmon Roll with edamame on the side. Del Sushi is located across the street from the UCSD campus, near the shops at Villa La Jolla and Nobel. 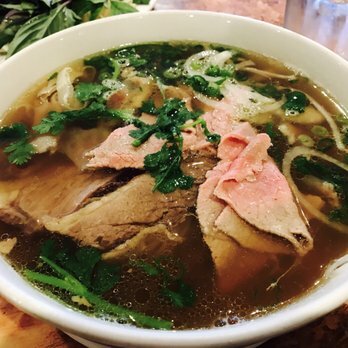 Vietnamese Pho is a popular dish in Southern California and Pho Duyen Mai offers some of the most authentic and best tasting Pho in San Diego! They have an expansive menu which features different type of Pho, Bahn Mi sandwiches, noodle dishes, egg rolls, spring rolls, and more! Our favorite items were the Surf and Turf Spring Rolls, the Pho Dac Biet, House Special Pho, and the Nem Nuong. All of the menu items are of excellent quality and taste very fresh. While it may seem like Pho Duyen Mai is just another hole-in-the-wall restaurant in the Convoy area, the elegant atmosphere elevates it above being just a casual eatery. Yet the prices are fair and affordable so you don’t need to relegate dining at Pho Duyen Mai to just a special occasion! Like many places in the Convoy area, parking can be tricky so give yourself plenty of time to find a space, especially if you’re going on the weekend or around dinnertime. They are open from 9am-9am every day of the week. If you're in the mood for a family and dog-friendly restaurant with mouth-watering dishes, then Lazy Dog Restaurant & Bar in Mission Valley is the perfect place for you! Treat the whole family to a night of delicious food and top-of-the-line service. They serve lunch and dinner of weekdays and on weekends they also offer a brunch menu. They offer an extensive menu of soups, salads, sandwiches, pizzas, burgers, and fusion dishes. 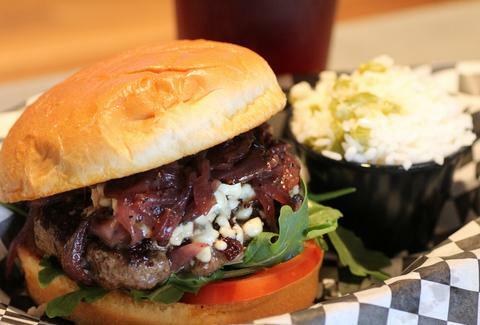 Our personal favorite menu item is the BBQ Bacon Ranch Burger. If you're hankering for something sweet, you can't go wrong with the white chocolate chip brownie for dessert. They also have a special dog menu if you decide to bring your best friend! Located near Crystal Pier on the Pacific Beach boardwalk, Kono's Surf Club Cafe has drawn beach-goers for its great tasting, all-day breakfast menu since 1991! Kono's is open Monday through Friday from 7am-3pm and from 7am-4pm on weekends. They also have a second location in Pacific Beach, called Konito's Cafe which is open from 7am-3pm every day except Thanksgiving and Christmas. The menu is simple, but delicious! It really hits the spot after a day of surfing or exploring the Pacific Beach neighborhood. Our favorite menu items include the Veggie Scramble, Chorizo Breakfast Sandwich, Big Breakfast #2, and Chicken Quesadilla. 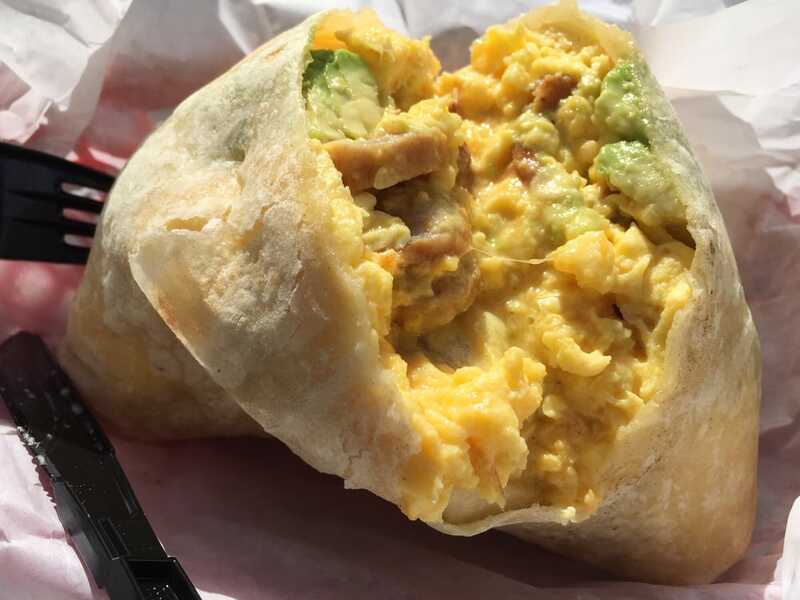 And of course, you can't go wrong with any of the breakfast burritos! 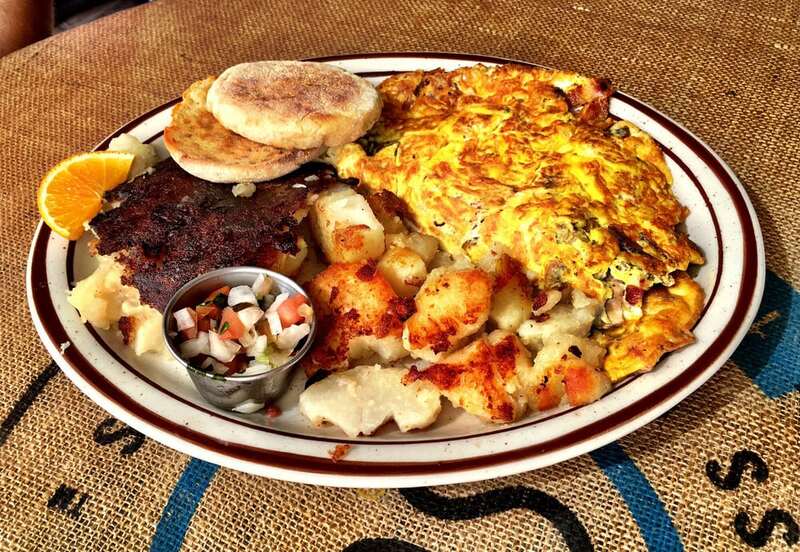 Stop by Kono's after your next surf trip and see why this cafe is truly one of San Diego's hidden gems! Seasons 52 is a fresh grill and wine bar that provides guests with a healthy dining experience. Their constantly changing menu is inspired by the seasons and the fresh appeal of the farmer’s market—52 weeks a year. They also draw inspiration from different countries around the world and many of their dishes represent the best in fusion cooking. The chefs start with the freshest ingredients and use natural cooking techniques such as a wood-burning grill to enhance flavors instead of relying on high-calorie additives. This allows them to keep each delicious item under just 475 calories. With a full menu of appetizers, soups, salads, entrees, and desserts, Seasons 52 allows guests to mix and match a culinary experience that is big on flavor, not calories! They also offer dining options for guests that are vegetarian, vegan, gluten sensitive, or dairy/lactose sensitive. Seasons 52 has two locations in San Diego at Westfield UTC and the Seaport District downtown. One of the hottest new restaurants in San Diego is Trust, an urban rustic restaurant in the Hillcrest neighborhood! Using locally sourced ingredients to put a spin on your favorite dishes and drinks, it’s no wonder Trust has become one of the most talked-about dining concepts in the city. Trust serves dinner daily, but it’s their weekend brunch that’s really a crowd-pleaser. Some of our favorite items that we tasted on the brunch menu include the Lemon Meringue French Toast and the Pancakes With Fried Chicken. The French Toast was decadent and delightfully lemony. The pancakes were the perfect savory accompaniment to the juicy yet crispy fried chicken. And of course, how can you have brunch without a round of mimosas? Try the Trust Mimosa made with aperol or one of their fruity flavors like blood orange! The restaurant itself is beautiful and trendy – the interior is decidedly industrial chic. Yet it still feels welcoming! Trust is the perfect place to enjoy a lazy Sunday brunch with friends or savor a romantic dinner with a loved one. Grand Ole BBQ Y Asado has established itself as one of the most authentic barbecue spots in town. This Texas style BBQ has all of San Diego raving! They are open from Wednesdays through Sunday from 12-6pm with a menu of Central Texas-inspired barbecue that ranges from Brisket to Tri-tip to Smoked Turkey to Pulled Pork and giant Beef Ribs. They also have Smoked Salmon and Smoked Lamb for those looking for something a little different. Grand Ole BBQ Y Asado often sells out early so make sure to check their Facebook and Twitter for updates! And be sure to note they have only outdoor seating so dress for the weather!